I cannot believe it’s been 4 weeks since I last wrote! There is a very good reason, however, not a very sensible one! I have been incredibly frustrated! I was told by my landlord for 363 Pequot Avenue that I had to delay the opening of my store due to ‘Zoning’ issues. Actually, it is called ‘Variance’ – which requires for every 200 Square feet of retail space in Fairfield County, retail stores are required to have a parking slot assigned to them. I should have had 8, I had 4. This fortunately was not my fault, however, it caused the delay and I am still not permitted to open until the issues have been dealt with! Well, this also has to do with The Pink Pom-Pom Project – we cannot hold events on the premises because it’s technically not ‘Open’. So, after having a minor melt down and Pity-Party-For-One, I am back on my feet and getting ready for the next Opening of the store. Although it stills remains a mystery, there is one near in the future! Please watch this space and keep supporting The Pink Pom-Pom Project! This entry was posted in ALL POSTS, The Big Events and tagged Cancer Survivorship Center Southport CT, The Pink Pom Pom Project, The Pom Pom Project Southport CT. Bookmark the permalink. 4 Responses to Oops! 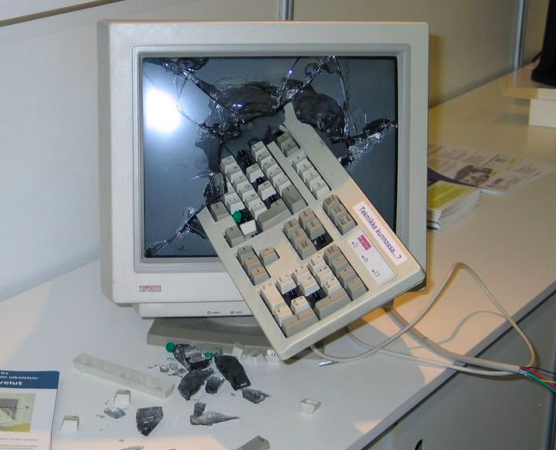 I Smashed My Keyboard! Anda, you’ve overcome much worse than this! Thank God you are smart and resilient . Giving birth is never easy and sometimes a long labor makes the delivery more meaningful. As for the computer, looks kind of dated, you probably needed a new and better one, anyway. Good luck, I know the shop and P4 will be a great success!!! you’ve gone from not enough hair to not enough parking — that’s pretty good in my book! I absolutely love your blog and find most of your post’s to be precisely what I’m looking for. can you offer guest writers to write content in your case? I wouldn’t mind composing a post or elaborating on a few of the subjects you write regarding here. Again, awesome site!